Sometimes people ask me how to draw or how to improve their work. I haven’t tried my hand at teaching too seriously. I’ve tutored and I’ve taught a home school group but if you’re in the Asheville area lets get together and have a drawing session. Here’s what I want to share with people that want to draw better or be better artists. #1 – Work on what you love! There is a book I recommend and I keep meaning to do all the exercises to improve my drawing skills. It’s called “How to Draw on the Right Side of the Brain.” It’s the only drawing book I own. The reason I haven’t been able to finish it yet is I get bored with the assignments. Do what you LOVE! I spent my years of elementary school drawing horses, cats, and other animals. I went and copied ever drawing of Lee J. Ames, another favorite author of mine. I love how these books instruct. He just has all these really good drawings, a short introduction and then the book is full of a theme, no more words. Cats, horses, dogs, zoo animals, birds, automobiles, boats, whatever book you pick out. Whatever you want to see on the paper DO it. Don’t draw flowers if you’re more interested in portraits. If it’s hard, if it doesn’t turn out the way you want, who cares. Enjoy the process. You are putting an image on paper. An artist came to our school to talk about her work and her entire work was tiles of the alphabet using random things to illustrate the letters, “U is for underwear” for example. That was what she loved and that is what she enjoyed doing. One of the students tried to ask her why she didn’t try something else. She just looked confused. I think back to that when I think about should I do more flower portraits since I love watercolor? Should I do more pet portraits since I’m in Asheville? You can do whatever you think of but why bother if you’re not interested. If every gallery has mountain landscapes don’t feel obligated to do mountain landscapes. Somebody loves mountain landscapes and it will come through in their art. You’re boredom will come through in yours. OK, I shouldn’t say that is always the case. Homer, Alaska every gallery has eagles, mountains, forget-me-nots, orcas -or whatever other types of Alaskan sea creatures, fish and fireweed. That’s about it. 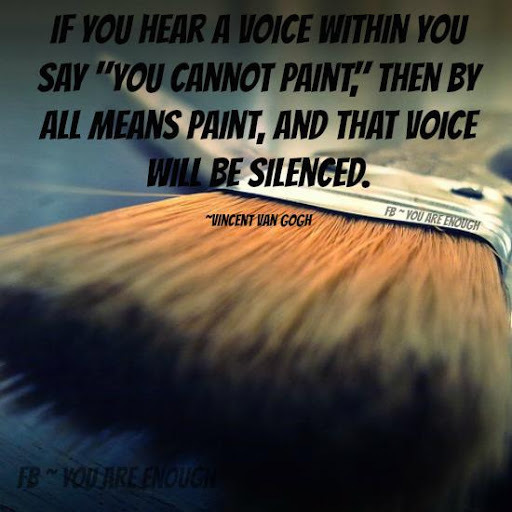 As an artist we often paint what will sell but don’t learn with this. Learn to paint what you love then you can move on to anything. 2. Don’t worry about the outcome, just play. Want to understand a medium? Experiment. Get a big enough piece of paper, pour on some colors and start mixing. Want to know how they react to stuff? Add it. Hairspray, soap, glue, salt, caulk, crayons, these are all things that have been added and there’s so much more. Do kids ever have a plan in mind? Make a mess and think about it later about what you like, what you see what you’d like to repeat and work on. Often when we let go we can get some really neat stuff. If you don’t like the outcome think of creative ways to reuse it. Cut it up? Paint over some new layer? 3. Be an artist in everything you do. To me, an artist is a creative person. Always creating, always looking at life differently. Practice this attitude whenever you remember. Are you cooking? Don’t follow the recipe exactly. Are you stumbling along in Zumba class? Make up your own moves -just don’t run into anyone. Think of a different place to kiss your spouse/partner, rearrange the living room, take a different route home, make up stories for people you see passing, try finding a new combination of your clothes to create a new outfit, see pictures in clouds and in trees, move that creative juice that’s in your brain. 4. Practice mind painting. I don’t know what to call it but I plan out paintings all the time. The first thing is to have a good understanding of composition and then see the world framed up in shots. There’s people sitting at an outdoor cafe. Would you center the couple? Leave in the full store front? I feel my brain is always like a focusing camera “zoom in on that” “crop that”, “take out the background clutter”. If you have time, think about the colors you need in order to mix the shades that you are looking at. If this scene was what you were painting, where would you start? Imagine a blank piece of paper in front of you and copying what you see on to it, line by line. Try converting the image in your mind to different styles. How would Van Gogh paint this? Georgia O’Keefe? What it if was a watery black ink drawing? I think this is why people think I’m so contemplative or detached. I don’t pay attention to conversations very well, I’m painting – in my mind. 5. Draw from your imagination. Doodle. There is no wrong because it’s in your head and it doesn’t exist anywhere else. Your drawing is bringing it to reality. Try drawing things that are in the real world. Draw emotions. What does anger look like? Happy? Bored? Or if that sounds too much like an assignment draw how you’re feeling or draw what high school was like, or make a map of your life path. Art is an interpretation, it doesn’t have to be exact. Switch hands and see what happens. Try not to pay attention to what your hand is doing, try not to control it completely. So you’ve used lines and maybe color to illustrate emotions now try analogies. What animal is your personality? Or what combination of animals? I think back to Bible parables and try to recreate my own life parables. Or think about songs and poems that have already done that and try to illustrate them. “Some say love it is a rose. . .” I like juxtaposition. Put a monkey in a kitchen – what does it mean? What’s the two most random objects that you would never think of together? What could you say your painting meant if they were together? Whenever I try this game I think of a pink flamingo lawn ornament. I need a new random thing. How about this, what does that object remind you of? What other memories does it trigger? Garrison Keilor, host of the Prairie Home Companion, talked about how to connect to people. It’s not so much about describing the feeling, it’s about putting the objects there where that feeling resides. So talking about the midwest he started listing all these items and I was suddenly thinking of home. I only remember pick-up truck and a stick of wriggley’s chewing gum. Art is about story. What stories do you have to tell? Literally, trying looking in a room and look at it from a different angle, different height. Look at objects and try to identify segment, instead of looking at a chair and following the line of the seat, the leg, the back, identify the highlights and shadows, look at the negative space of the rungs, what shapes does that make. Are you familiar with negative space? Negative space has a shape and a form when it is drawn, it has to be identified as “not there” but it’s still a line on the paper, it may still be a color. Seeing negative space is a real skill to train to, it is just as important as the object but everyone focuses on the object. I’ve seen drawing assignments that have you only draw the negative space. It’s recommended for drawing portraits. We seem to do a better job of drawing what is not there than what we “think” is there. Try it. 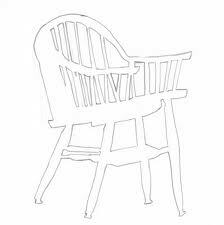 set out the kitchen chair and draw the negative space around it and see the chair take form. Try looking creating a “picture in a picture”. This was another Arts High School assignment. We had to find a frame and a composition through that. Lots of people did window frames, there’s staircase railings, key holes, doors that are open a crack, chair rungs. What gets framed up inside these real life frames? What’s the perspective of a 6 year old? Look up at something you usually look down at, look down at some that is usually eye level. Move around, get on a different plane. What about those games as a kid, this looks like. . .it’s like art scrabble. Look for the face of Lincoln in a pile of laundry or imagine the material you are seeing be something else, for instance, I’m looking at my art desk and there is a clear plastic bag with the sun shining through it. This is a perfect reference for me of how a clear veil might look.